The main pillar of our company has always been liquid feeding systems for pigs and it's history dates back prior to the company being founded. JD Welding, a now defunct company began selling liquid feeding systems from Ernst Graf AG of Switzerland in the late 1980's. In the late 1990's they took on a second brand, Hampshire Feeding Systems of England, who at the time was the British dealer for Ernst Graf AG. 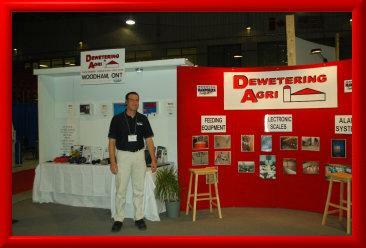 It was also during this time that the founder of DeWetering Agri, Dennis DeWetering began working at JD Welding. After a few years, JD Welding merged with another equipment company and both Graf and Hampshire were no longer sold. When DeWetering Agri was founded in 2006, the liquid feeding concepts of JD Welding, as well as the Graf and Hampshire lines were brought back into circulation. Soon after the company also began selling Agri-Alert alarm systems, as well as Leeson electric motors. In the fall of 2010 we began selling a new liquid feeding system from PONDis AG of Switzerland. In the last few years we have added dry feeding, stabling and ventilation to our line of priducts, making us a full line dealer of pig and poultry equipment. No project is too big or too small!